Not having to tie your own shoes comes at a steep price. More than eight months after introducing the HyperAdapt 1.0, Nike is finally making its highly anticipated self-lacing shoes available to the public. The sneaker costs a whopping $720 and is pitched as the consumer version of Nike's 2016 Mag, the model inspired by the film Back to the Future Part II. Obviously, what makes them both stand out are their power laces, because who can resist not having to tie their own shoes? I tried on the HyperAdapts at a private event in New York City, and despite wearing the limited-edition Mags before, I couldn't help but feel tickled when I first put on the new pair. 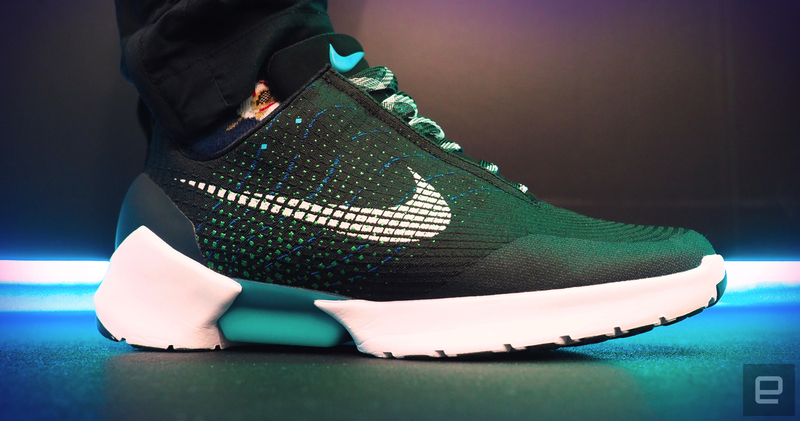 Since self-lacing sneakers are still a rarity, it's hard not to be instantly impressed. At first I was touching the shoes gently, trying not to break anything as I slid my feet into them, but I was soon told I didn't have to treat them any differently than my traditional kicks. 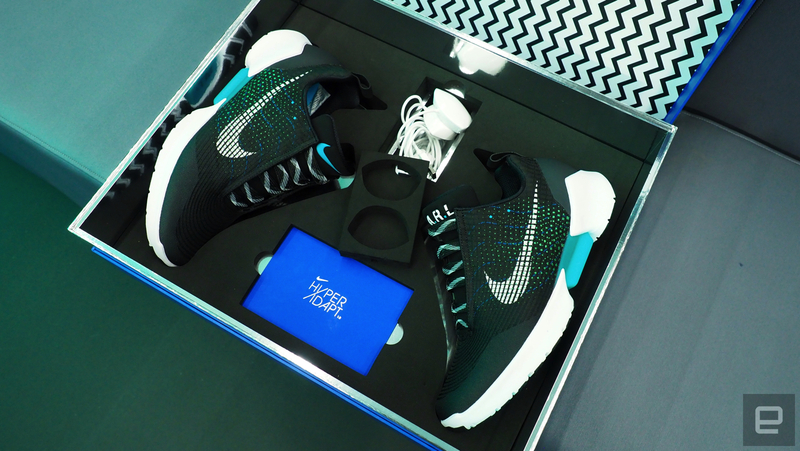 Tiffany Beers, senior innovator and engineer at Nike, says HyperAdapt 1.0 was designed to be a full-on performance shoe and not simply a collector's item. What makes everything tick here is a system dubbed E.A.R.L., short for Electro Adaptive Reactive Lacing, which activates itself as soon as your heel hits the insole. If you need to adjust the laces, there are two buttons on the shoe's upper, one for tightness and the other for looseness. I found the auto levels to be comfortable every time I put the HyperAdapts on, but that may vary depending on the shape of your foot. Either way, Nike says E.A.R.L. is smart enough to know the amount of tightness it should provide when you lace up for the first time. The E.A.R.L. mechanism makes a loud sound when triggered, but it's oddly satisfying to hear. It all feels reminiscent of that scene in BTTF Part II when Marty McFly says, "Power laces, all right." As you would hope, the HyperAdapts are comfortable to wear and true to size. They're shaped similar to other performance shoes, meaning they won't feel much different than what you're used to walking or running in already. The power laces are what make them a low-top on steroids, though. You'll also notice that blue block on the bottom of the HyperAdapt. That's used to indicate how much power you have on your shoe: A blue light means you're completely charged, yellow is halfway and red signals that you're running low. To charge it, you use a white magnetic puck that's included in the box. Nike says the sneakers can last up to two weeks on a full battery, though that could be longer if you don't activate the power laces too often. Beers, for example, claims she's worn them for eight to 10 weeks with a single charge. There are LEDs on the back too, which light up every time E.A.R.L. is doing its job. HyperAdapt 1.0 will arrive at a couple of Nike locations in NYC on Dec. 1st, including the company's new SoHo store and the Nike+ ClubHouse (45 Grand Street). And while they're not as rare as the 2016 Mag (89 pairs), you'll want to book a Nike+ appointment soon for a chance to buy them. The sportswear giant says a wider release is expected later next month, along with a new silver color. There's also a white one available, but that's limited to athletes and celebrities who are part of the Nike family. We'll have more on the HyperAdapt 1.0 in the coming weeks. For now you need to ask yourself whether you're willing to pay $720 to own a piece of the future of footwear.